I often hear the opinion that "Access isn't fit for serious applications". Finance is of course very serious... and extremely serious in Switzerland; needless to say that I never expect much business from that particular branch. The main reasons are of course security and volume. You don't want numbered account information travelling on a laptop, and you won't handle a million daily transactions or fifty thousand cash distributors with Access. Let's be serious. When analysing a project in this context, it appears that the main, or only remaining problem is the difficulties in performing lookups. In a spreadsheet architecture, this is solved by dependency chains. Since financial historical data is very much static, the update chain of depending cells is rarely triggered, so the overall performance is good even when numerous complex lookup operations are involved. Not so with a database architecture, where all derived data is recomputed every time a query is run. This article will show that the nature of financial lookup operations makes them hard to handle in Access, enforcing the prejudice. However, by using "fast table lookup" techniques, this difficulty can be overcome, with great success. A demo file containing the skeleton of a portfolio management system is provided, with all needed lookup functions, but only a simplified support module. If you wish to implement similar functions in your application, please read also Access Techniques: Fast Table Lookup Functions, which contains further demo files. The other way around, the present article serves as an elaborate example, illustrating one field of application for them. Now what's so special about finance, seriously? This section is a crash-course in currencies and rates; it briefly introduces the concepts I needed to understand before I could even start planning data structures and processes, when managing multiple currencies was a requirement. For most people, and for most programmers, a currency value is just a number. In Access, it's a numeric data type. But that's only one third of the story. When you hear "this watch cost at least one grand", the number 1000 is in fact complemented by two implicit facts: it's an amount in US dollars, and it's today. Thousand Yen (today), or thousand dollars in 1900 would not mean quite the same thing. But for most practical purposes, creating a currency column is all a mere mortal needs to manage money. In finance, each amount (value, price, cost...) needs three fields: a number, a currency code, and a date. Likewise, in science, each measure needs a number, a unit, and a context (which often includes a date). But unlike science, there are no fixed conversion functions. 20 °C = 68 °F is always true, but 110¥ = 1$ isn't. It has been true two dozen times or more in the last five years (the last time around 2008-08-22) depending on the granularity of the past exchange rates record being examined. We don't know if or when it will ever be true again. At the time of writing, 110 Japanese Yen are worth almost a dollar and a quarter, or one dollar almost 89 Yen. Once more a field is missing! A rate needs two currency designations: "from" and "to", e.g. $»¥, ¥»£, £»$. But let's switch to ISO three-letter currency codes. The rate USD/EUR: 1.48825 could mean "one Euro costs 1.49 Dollars", or the inverse figure, 0.67193, "one Dollar sells for 0.67 Euro". But the rate EUR/USD can be a little higher, because selling and buying prices are never exactly the same. Foreign Exchange traders and banks need to make that distinction, but neither is likely to store the minute-by-minute rates from their data streams in an Access database. In most financial situations, rates are "value rates", averaging buying and selling quotes. So the equation 1 / 1.48825 = 0.67193 is valid to obtain the EUR/USD rate from USD/EUR; and GBP/JPY can be calculated from USD/GBP and JPY/USD -- there is no cost involved in the intermediate transaction. Furthermore, all applications have one home currency, and only rates against that currency are stored. The base currency is the missing field from the data structure: it is a global setting of the application. That leaves one problem. If the table shows the rates "GBP 1.6482" and "JPY 88.976" for today, USD being the application's base currency, they do not mean the same thing. The first is a "direct" quotation, the value of one pound in home currency, noted USD/GBP, while the second is "indirect", quoting the value in foreign currency of one dollar, noted JPY/USD. However, I used to think of Pounds as being ~2¼ Francs (~1¾ more recently), and dollars as being more than one Franc. These are the direct quotations. The multi-currency applications in which I was involved all had at least one or two currencies for which direct quotations were preferable, even internally. The field 'Parity' is hence a yes/no field describing the directionality of the rate, it could have been called 'Indirect'. This is all rather confusing at first, and the figure below should help. If you want more details, please consult the relevant page on Wikipedia. The figure shows six month of weekly exchange rates for the Zindirian Peso (ZIP) against our home currency, the Gemini Mark (GEM), which was severely depreciating in March, followed by some instability. The left chart shows indirect rates starting at 100 ZIP for one GEM; the derived direct chart on the right is flipped vertically * starting at 0.01 GEM for one ZIP, with ZIP appreciating in March... Mathematically equivalent, but semantically opposite! * If you have sharp eyes, you noticed there is a distortion. This is due to the linear scale; there wouldn't be any distortion using logarithmic scales for rates. One other mysterious aspect of the chart is the meaning of the lines joining the Friday rates. Lines suggest a continuous process, the rate dropping or rising smoothly during the week. In reality, the rate fluctuates every day, every hour, every minute... If you zoom in close enough, you will only see individual transactions, at a given time, for a given price; a discontinuous process. The figure at the left is closer to what really happened: it includes at least daily rates. The figure at the right shows how weekly rates are being used. The missing rates are not interpolated; the value lines are always horizontal. Friday's rate is used until next Thursday. The same principle applies to coarser and finer granularities (monthly budget rates, daily reference rates). A rate is valid until replaced. And that principle is the fundamental mechanism we need to implement in all financial databases. The following week, the rate drops to 80.6, so the same amount would jump to 31.02 GEM. "Give me the first rate you find for the currency before or at the relevant date, in reverse chronological order." "Give me the first rate expressed as direct rate for ..." A direct rate is a multiplier. This is our first tool: a lightning fast currency exchange mechanism. Why is it so fast? Let's break it down. There might even be room for minute improvements, but again, this is not the place. What about an amount that is already in the application's base currency? It doesn't need to be converted. This is easily solved by a test (or perhaps by inserting one single rate of 1.0 for the base currency on 1900-01-01). The same type of lookup will appear in all other time-based track records. Let's follow a fictional development project. A low-cost simple Portfolio Management system is required by one of our clients; he is thinking perhaps an Excel workbook with "some automation". He doesn't believe that Access can handle it (he is a serious financier), but accepts to look at a proof of concept. So we start building. This looks familiar, especially the date fields being part of multi-field keys... The relationship between Assets and their Net Values (NAV) is very much like that between Currencies and Rates. The same is true for Portfolios and Shares or Assets and Shares. We already have the tool for that. It's really the same, just as simple, just as fast. Now it's time to turn away from data structures and SQL and build some forms, enter some dummy data, polish the interface. Benchmarking the queries is a pleasure, everything is in order... it seems that Access can do the job! First report: a Portfolio status at any given date. For each asset, find the last prior update in number of shares (check! ), the corresponding Net Asset Value (check!) the best exchange rates of both the Asset's base currency and the Portfolio's preferred reporting currency (check! ), and calculate the total value (easy!). The query works, so does the report. Just before the presentation, someone suggests to add the MTD and YTD values (month-to-date and year-to-date return in the report's currency). That takes a little session of head scratching and copy-pasting sub-queries, but it is relatively easy, and still fast. If you enjoy reading SQL, this is the full query. Maybe the demonstration was a success. But now that the real development starts, it becomes apparent that it will be very unpleasant. The problem begins with the last query. It works, and it's even still readable, but let's look at it from an analytical point of view (no need to zoom in). 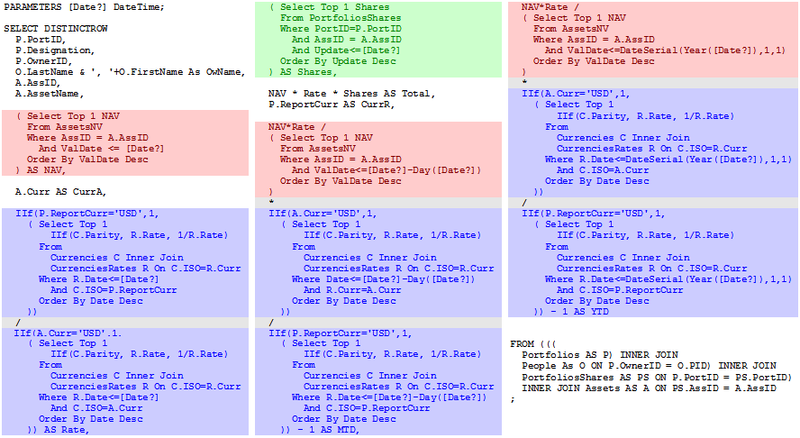 The colour coding reveals one lookup for the number of shares in green, three NAV lookups in red (present, last month, and last year), and six rate lookups in blue. What's wrong with that? It has twenty tables. Still below the 32-table limit, but not by much. Anything more complex than a simple status report might hit the limit or become too difficult to evaluate or optimise for Jet. It isn't modular. It was easy to build, thanks to copy-paste, but I don't want to edit, debug, or maintain it. We no longer have an exchange rate engine, but an army of them. It isn't portable. Each sub-query has subtle differences with all others, highly specific to the context. Copy-paste is good, but the right details must be adjusted every time. It isn't documented, and cannot be documented internally. If this is a simple routine query, will all queries be like that? What if the database becomes just slightly more complex? If the Assets are in fact Funds, distributing dividends, performing splits and joins, re-basing their base NAV yearly? Suddenly there will be four or five tracks for each Asset, which need to be combined to compute a value. If the Portfolio needs a multi-currency cash side-account, it can create a whole new group of exchange rate sub-queries. Then there is the interaction of complex queries with groups on reports, the difficulty in using complex queries as source for synthetic queries, performing econometric evaluations, etc. Where CurrNAV returns a NAV for any date converted to any currency, and AssetShares() returns, well, Asset Shares in a Portfolio at a given date. So, that's what we need: functions. If you presented the problem to the serious developers next door, he would probably say that this would be trivial in BlingSQL, which supports functions and much more, but since JetSQL doesn't, there isn't a solution. Although it's technically true, Jet doesn't provide functions, it has very strong ties with Visual Basic, which provides function support "and much more". As a language, it is just as fast and structured as BlingSQL's integrated functions. The serious argument that integrated function will automatically be optimised better doesn't hold in our case, because the DAO library exposes the indexes of the table, for seeking and navigation. A feature not found in Bling, paradoxically. Note: The long version of what follows is the topic of the article mentioned in the introduction. In a nutshell, an Access table can be opened as a recordset using a special "table mode". Such a recordset can be assigned any existing index of the table, which is then used in several methods: Seek, MoveFirst/Last, MoveNext/Previous; and properties: NotFound, EOF, BOF. In a financial context, Seek and NoMatch is all we need. MsgBox "No GEM was found." For the best performance, the recordset should remain open between calls. The demo database contains a function GetTable(), explained in detail in the linked article, which returns a table already set to use the "PrimaryKey" index, and also maintains the table open between calls. With this out of the way, here are a few of the functions in the demo database. Retrieves the "dollar parity" flag, also called "indirect quotation" method for rates, for the currency ISO. Returns the latest exchange rate of ISO before or at Day, in "indirect" format (one dollar expressed in ISO). The rate of the base currency is always 1. Note that when there is a match, it doesn't necessarily mean that ISO was found: Seek could have located the last rate of the currency just before in alphabetical order, and hence "smaller" in terms of index position. This explains the additional test comparing the field "Curr" with the argument ISO, even if there is a match. A robust and friendly function to exchange between any two currencies for which data is available. Robust by handling and returning Null correctly, and friendly by using today's date by default. You can test this function in the "currency calculator" provided in the demo. All of them could be written as a sub-query (or a group of sub-queries). Before I conclude, here is also an example of a query used to retrieve monthly returns from across the tables, regardless of the update schedule of Assets and related Currencies. The table 'zsMonths' contains a single column 'M' with the numbers 1-12. The query calculates monthly returns by dividing the end-of-month NAV by the previous month's end NAV, minus one. This sort of returns table is useful in econometrics, for example to calculate the Sharpe Ratio (Wikipedia) and similar estimators. This tiny application, in Access 2000 format is exactly the "proof of concept" Portfolio application discussed earlier. With one major difference: it doesn't use a single sub-query, but only fast table lookup functions. To avoid any off-topic navigation issues, it is locked in the year 2000, and uses simplistic interface techniques, including parametric prompting queries. When asked for a date, choose one in the year 2000, and for best results the last day of a month. One econometric report and two charts show that derived data (obtained from the functions) can be used in higher level constructs. Make sure to change the parity flag of currencies and observe the effect. The purpose of the demo is really to demonstrate fast table lookup functions in a plausible context, and how they can be used much like integrated functions of other SQL implementations. The interface is only a bonus. The interface is minimalistic in style and scope. Feel free to dissect it and recycle any parts, but please ask any question you might have about it in the general forums, and not in the article comments. The demo database emerged almost spontaneously while working on the main article about Fast Table Lookup Functions. The first section is part of what I had to learn while working for financial institutions and provided a perhaps superfluous but not unpleasant introduction to the main topic. The article is also based on real experience. I have used fast lookup functions extensively in three major projects and several smaller ones. The first time, it was in a financial context, a field in which I knew next to nothing. I took pleasure in discovering some econometrics and in the challenge posed by the problem described here. My gain as developer was the removal of a serious flaw in my perception of Jet. Before that experience, Jet was the "engine". Something I used from the interface or from Visual Basic, but not in any interactive way. Of course I knew I could call VB functions from a query, but these were always interface related. The notion that a function could be used for the benefit of the Engine, to simplify queries or to circumvent limitations, had never occurred to me. I hope this will inspire fellow Access developers and perhaps, in some small way, change the prejudice against this platform in financial circles.